The entrance hall with its straw roof out of rye was in former times the barn of the Plattnerhof. Beekeeping instruments of today and historical everyday farmers` objects can be seen. During the guided tour the life in a beehive and the production of several bees` products are explained. On request there is also a multimedia big screen presentation on different themes. Now some extracts from the guided tour. This kind of magazine-bee-hive allows the apiarist to check, change or take out the frames without disturbing the bees or even destroying the combs. A grid prevents the queen bee from getting through, but allows the other bees to do so. In this way the brood chamber under the grid, where the queen bee lives and lays the eggs, is separated from the honey room above. When a colony of bees is expanding intensively or if it is storing much honey, the apiarist can enlarge the beehive by adding boards with combs (honeyroom). In the upper board you can see a plastic feed box. The bees are fed out of this box with sugary water for the winter as the apiarist has partly taken the honey. The apiarist puts wooden frames into the magazine. A wire is fixed into the frame and heated with electric current and melted together with a prepared middle wall, which are sheets of beeswax foundation that is imprinted with the shapes of hexagonal cells out of beeswax. The bees use this foundation to build straight combs. In this way the apiarist is able to take the combs out of the beehive in a comfortable way. The electric current with low voltage is delivered by a transformer. To get the honey without destroying the combs Baron von Berlepsch from Germany invented the movable comb frames. The apiarist puts the unsealed combs into the extractor. By rotating the wire basket centrifugal powers arise, so that the honey can run out of the combs. The honey flows into the cylinder of the extractor and drains through a tapgot and is then collected. Under the tapgot there is a strainer which filters out large debris such as wax and dead bees. After that the combs are turned around, so that the honey from the cells on the other side of the comb can be strained. 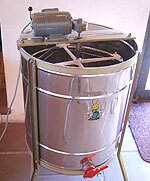 Nowadays the extractor is driven by an electric motor. With the uncapping fork or -knife the apiarist slices off the caps from combs of sealed honey, so that he can take out the honey by straining it. Today the fork is partially heated by steam or electricity. While the apiarist is working at the open beehive, the bees' desire to sting is dampened by smoke. The bees gather pollen as a kind of protein which they need in order to grow. This extremely concentrated protein is also valuable for us, for example as a dietary supplement for vegetarians or to sensitise those allergic to pollen in the pollen free time of the year. To get the pollen this pollen trap is fixed in front of the flight hole. The homecoming foraging bees press themselves through the little holes and strip off their pollen baskets. The pollen falls into a container. A mesh prevents the bees from being able to collect the pollen again. When a queen bee dies or the place inside the beehive gets too small, the worker bees begin to build combs out of the cells for a new queen bee. In this cone shaped, enlarged cells the larva of queen bees is fed with "Royal Jelly". The first born queen bee will kill any later queen bees, therefore the apiarist puts each enlarged cell into a little cage (on the right) and the queen bee is born there. Other cages (in the middle) are used to put a new queen bee to a colony which has no queen bee. Young queen bees are sold and even put in these little boxes (on the left) and sent by post.